Still looking for the perfect School Bag for your teen or tween? Check out Dandelion Earth-Friendly Goods’ Organic Tote Bags with trendy patterns and eco-expressions, not to mention tons of pockets and pouches for school essentials! With Dandelion Earth-Friendly Goods’ new collection of organic cotton canvas tote bags, going green has never looked more stylish! With 6 designs to choose from, the new organic cotton canvas bag is versatile, fashionable and will become that one bag that will always accommodate ones style. 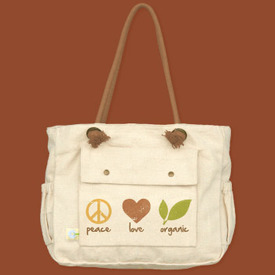 The tote bags are made entirely of organic cotton and use no pesticides or chemicals in the growing cycle. Each bag has four outside pockets- one big snap pocket to store valuables, two elastic holders for cups or water bottles, and one catch-all pocket. The tote bag includes a roomy interior with several snap pockets as well as a key clip for easy access. Not only do they make a wonderful book bag, they are also a great over the shoulder bag for a day out shopping, a day at the beach, or a sports bag for extracurricular activities - the possibilities are truly endless! Use coupon code BTS until the end of September to save 25% on any Tote Bag ordered from the website.